To the children swarming her tiny toy stand in Cileungsi, Indonesia, Melia (R) might as well have been Santa Claus. The nearby school had let out for lunch, and before parents could corral their kids, some made a beeline Melia's treasure trove of Pokemon cards, Play-Doh packages, Winnie the Pooh books, and toy cars. One girl settled on some stickers and turned to her mother to ask for money. Moments later, Mom was fishing a couple of bills out of her purse. Melia is just one of many micro-entrepreneurs I met during my recent visit to our programs in Indonesia and Myanmar (Burma). During the trip, I was reminded of how God is using our micro-enterprise development programs – not only to improve the financial conditions of families, but to strengthen the faith of believers and to extend the work of the local church. As we celebrate Christmas, the coming of Emmanuel – "God with us," it is my honor to explain how Five Talents is serving as Christ's hands and feet in some of the most downtrodden and impoverished communities in the world. The slums of Jakarta. The Irrawaddy Delta of Myanmar. The mountains of Peru. The post-conflict regions of South Sudan and Burundi. Five Talents has been called to places like these, and I'm humbled to report that, because of God's blessing, lives are being transformed. It is easy to consider only the economic impact our beneficiaries feel when they launch a new micro-enterprise, or improve on an existing one. For example, a woman makes crackers out of cassava leaves to put a child through school. A water distribution business provides a community's first regular access to clean water. Indeed, in each of our programs, parents are creating a steady, sustainable income and learning how to budget their finances. Children are going to school with new uniforms and the required textbooks. Women are making savings deposits and preparing their families for future expenses that might otherwise stall the growth of their micro-enterprise. Communities are growing more united. But there's more. We've found that women and men, after joining our programs, become more hopeful. Many report that their spiritual lives are maturing, and that their faith is growing. I remember one such example vividly. 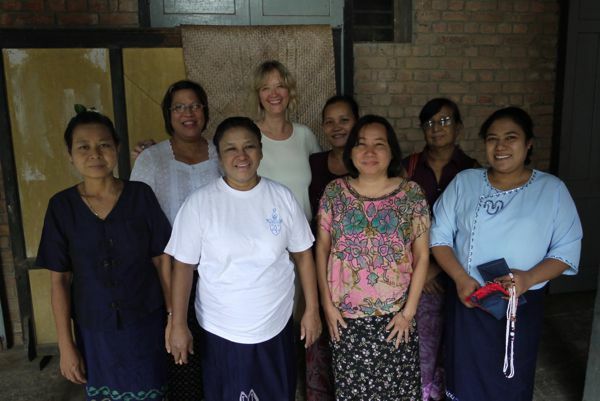 I'd just spent the good part of an afternoon running a budgeting workshop for women in the "Phoebe" savings group in Yangon, Myanmar (L). Near the end of our time together, some of the women shared how their spiritual lives had begun to change since joining a savings group and launching a new micro-enterprise. "Starting a business has helped me rely more on God," Jean, who sells cosmetics, told me. Her testimony was echoed by other members in her group. Investing in a micro-enterprise – or any business, for that matter – can be scary. These women shared how, by taking a risk and seeking to do more with the resources and talents God has given them, they were being blessed far beyond their financial situation. Their spiritual lives were enriched. Their relationship with God was strengthened. Some of these woman also said they are now able to tithe more to the church and thus are extending its ministry throughout the local community. Another woman in the group, Lydia, runs a small daycare center. With her savings she was able to buy new pillows and mats for the children under her care. As we celebrate Christ's birth during this holiday season, I hope you will join with me in prayer for the women, men and children in Five Talents' programs. God is indeed with us. Please also consider making a transformative gift that will enable our holistic approach – combining services targeting the financial, personal and spiritual – to deliver hope year-around in new communities in Indonesia, Myanmar, Peru, Burundi and beyond.